Restoring degraded farmland to wetlands could effectively remove carbon dioxide from the atmosphere, but the benefits are long-term, not a quick fix, according to new research published in the journal Agricultural and Forest Meteorology. “If we want to achieve targets for limiting climate change, we need to not only reduce greenhouse gas emissions, but also start actively removing carbon dioxide from the atmosphere. Wetland restoration could be one way to do this through natural means,” says Kyle S. Hemes, who led the study as part of his PhD research at the University of California, Berkeley. 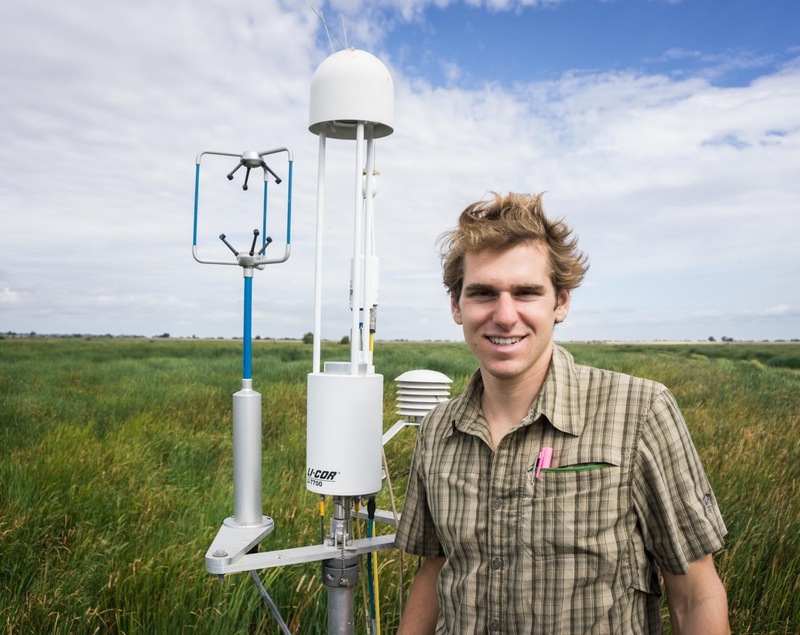 Hemes’ research was funded through a Delta Science Fellowship, a partnership between the Delta Stewardship Council’s Delta Science Program and California Sea Grant. Plants and soils are responsible for huge fluxes of carbon both in and out of the atmosphere, so researchers have been working to better understand the factors that influence these carbon fluxes. Wetlands have been a big question mark in this equation, since they can both take up and store carbon dioxide, but also emit methane, another potent greenhouse gas. For the study, Hemes and his colleagues at UC Berkeley used 36 site-years of carbon dioxide and methane flux data recorded in the Sacramento-San Joaquin Delta, the large delta system that empties two large rivers into San Francisco Bay. The landscape which today is largely farmland, was once dominated by wetlands, and there is growing interest in restoring some of the land to wetlands, which can have benefits for water storage, wildlife habitat, and recreation. On top of these benefits, the State of California is hoping that restoring degraded wetlands could help fight climate change. Kyle Hemes with one of the instrument towers used to measure greenhouse gas fluxes in the wetlands. Credit: Dennis Baldocchi The new study was the first to synthesize greenhouse gas flux data over a long period of time in the Delta, giving a clearer picture of the potential benefits and trade-offs of wetland restoration for climate mitigation. “We found that restored delta wetlands really effectively remove carbon dioxide from the atmosphere,” says Hemes. However, because wetland conversion initially leads to increases in methane, the study found that it takes 50 years for the net effect to reach neutral, and around 100 years before wetlands become an overall sink for greenhouse gases. The study also identified differences in greenhouse fluxes for different types of crops and wetland types, which could help inform incentives and strategy. As policymakers in California and beyond look towards solutions to climate change, it has become clear that decisions relating to the land will play a key role in reducing the concentrations of greenhouse gases in the atmosphere. “I hope this research is used by people thinking about natural climate solutions in California. To understand potential benefits and the potential unintended feedbacks, like this methane. It really confirms that ecosystems work slowly. In 150 years, we’ve lost carbon that was built up in soil over 5 to 6 thousand years. So restoring ecosystems can be effective but is a slow process to recapture that lost carbon,” says Hemes. “It has taken over 100 years to get into this mess of highly subsided soils. Using ecological solutions to fix this problem and restore the soils to sea level will take another hundred years, if not more. So the public will need to be patient and persistent in maintaining these lands in their restored state for the long, long run,” says UC Berkeley researcher Dennis Baldocchi, Hemes’ PhD advisor and a study co-author.